Classrooms and lecture halls now come equipped with streaming and recording capabilities. It’s what’s on the inside that counts. As profitable companies have long understood, keeping employees educated, informed, and in touch with each other is a safe investment for promoting longterm growth. So it’s no surprise that corporations of all stripes—from manufacturing to financial to pharmaceutical—have looked increasingly to AV consultants to help them raise the bar on internal communications. Whether they’re designing fully self-contained campuses, planning dedicated simulation centers, or bringing new collaborative capabilities to HQ, AV integrators have a more active role than ever before in benefiting their clients’ balance sheets. The bottom line: improved corporate communications and training is mission-critical. Rich Wisneski, manager of design engineering for AV integrator SKC Communications, sees the concurrent evolution of corporate boardrooms and training initiatives as a distinct opportunity to expand on what his firm can do for their clients. “We have to keep the ‘three C’s’—collaboration, communication, and creativity—in mind every time we build a room for these purposes,” he explained. “For ‘collaboration,’ the question is, ‘What tools do they need?’ Just sharing from laptop to laptop may be big for some companies, but others may need to allow everyone to annotate shared material on any number of devices from iPads to slates, tablets, or a MicroTile wall that’s wired for multiple touches. “On the ‘communication’ aspect, it’s not only about video or audio conferencing, but the streaming and recording capabilities. They want to know, ‘How can I maximize that room for a global workforce that’s in China, Canada, and America?’ By building in high-quality streaming, we can put them all in the same room so they can communicate visually, aurally, even tactilely. At the NYC -based technology consulting firm Shen Milsom Wilke (SM&W), an influx of large-scale, high-profile corporate training campus projects underscores just how important this effect is. SM&W’s managing partner, Thomas Shen points to his company’s role in developing progressive systems designs at new, ground-up training centers for General Electric, Honeywell, and a global tax and auditing firm as evidence of corporate America’s growing emphasis on gathering employees for focused education, networking, and team-building. SM&W recently helped the latter of these clients complete one of the largest dedicated corporate training centers in the world. “It’s a wholly self-contained campus, encompassing over 1,000,000-square feet of training spaces, classrooms, large-venue meeting areas, conference and meeting rooms, telepresence rooms, etc.,” Shen said. This training campus also includes an 800-room hotel solely for the use of the company and its personnel. In addition to the training spaces, the campus includes facilities to support social venues, fitness and exercise, dining, entertainment, and more. Digital signage boards are placed in gathering spaces for visitors to interact with. At the tax and auditing firm’s new training campus, no-holds-barred AV integration is the core of what makes this advanced multi-acre facility tick. 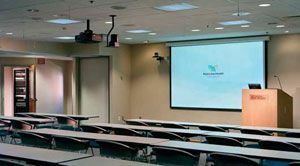 While excellent visual and audio quality in each classroom are a given, it’s the application of AV in virtually every aspect of an attendee’s experience in the building that points to the bigger possibilities. Common at the university level, problem-based learning has been a prolific form of pedagogy, and technology consultants like SM&W have developed convenient methods for students and instructors to share information within the classroom. For in-session collaboration, SM&W designs polling systems using mobile phones or custom handheld wireless devices that measure audience response then shares the results instantly with the room for further discussion. Information content can be shared instantly between a student’s laptops/tablet computer and with the entire classroom, all wirelessly through the support of an enterprise Wi-Fi network. SM&W is helping people find their way around a large corporate training campuses by designing digital signage boards placed in hallways and gathering spaces, which attendees can interact with for room location and scheduling information. Furthermore, SM&W designs systems with Radio Frequency ID (RFID) technology to allow communications between the digital signage boards and a visitor’s unique ID card, providing instant identification of the employee, and allowing them to learn their itinerary simply by walking up to the display. As the possibilities at plugged-in corporate communication and training centers expand, so do clients’ needs for the valuable knowledge and experience that AV firms bring to each project. According to Advanced AV’s Eric Bixler, beyond selling their brain power, the additional opportunities for designers to build on margins lies in customers’ increased needs to effectively engage employees who they simply can’t afford to fly in for every meeting/training session that takes place—or who may be increasingly resistant to taking the trip. LifeSize Camera 10x is the company’s first 10x optical zoom camera designed for large meeting rooms, auditoriums and lecture halls, this new HD video conferencing accessory option delivers increased zoom capability to support Full HD quality video, even at significant distances. Bundled with any of the LifeSize 220 series endpoint offerings, the product ensures that no facial nuance, expression, or gesture is missed during an HD videoconference. LifeSize Camera 10x key features include improved pan tilt zoom functionality; smoother operational handling for more lifelike interactions; 1080p30 support and increased zoom capability; full HD video to support larger meeting rooms; improved low light handling; antiglare visor; reduced light glare on lens; and support for cable length up to 328 feet (100 meters) so that HD video can be captured even in large meeting spaces. Panasonic’s AW-HE120 is a pan/tilt/zoom camera featuring a 20X zoom lens and a three 2.2 megapixel U.L.T. MOS imagers supporting full HD video capture. Ideally suited for such demanding applications as sports, staging, houses of worship, news, and government video, the HE120 is equipped with the same high-performance sensors and DSP used in Panasonic broadcast camcorders. With a signal to noise ratio pushing 60dB, 1,000 TV lines of resolution, 16-axis color correction, and Panasonic’s exclusive DRS (dynamic range stretch), the HE120 sets a new performance standard for integrated pan-tilt cameras. In addition to preserving RS-422 serial compatibility with controllers designed for use with the previous generation of Panasonic remote camera systems, the HE120 supports both direct and Web-based IP remote control. Direct IP control is possible using Panasonic’s AW-RP50N, as well as appropriately programmed systems from Crestron, AMX, and other manufacturers. Thee Polycom UC Board improves communication and collaboration in video conferences by allowing meeting participants to leverage their existing video display screens and mobile devices as interactive whiteboards for video collaboration. The Polycom UC Board is a simple and cost-effective solution combining a plug-and-play receiver and stylus with a compact design for portability. The solution transforms LCD monitors and display surfaces into a video whiteboard space, so every participant can stay fully engaged. The Polycom UC Board software natively integrates with the latest Polycom RealPresence Room HDX solutions to share content. Users participating in a video meeting can also share content such as a presentation, and use the Polycom UC Board to write, annotate or highlight key points, right on top of the presentation for everyone to see in real-time. Collaborate is an all-in-one voice, video, and data collaboration console for organizations using unified communications software or web services communications. Delivering plug-nplay simplicity in a business solution for video collaboration, the ClearOne Collaborate allows small groups in an executive office or conference room to converse and see each other while simultaneously viewing data from applications, web sites, or other local or network sources.The system is ClearOne’s first to incorporate video capability and features an integrated ClearOne HDConference audio conferencing system, a 46-inch HD LCD monitor, an HD USB video camera, and a built-in quad core PC with Windows pre-installed. Collaborate is also available without an operating system for enterprises that have customized or bulk licensed software. Vaddio’s AutoTrak 2.0 is a classroom camera. The instructor wears an IR lanyard belt pack that emits infrared light received by an IR PTZ camera. Video is then sent from the IR PTZ camera to the tracking camera. In addition to moving from side-to-side, an autopilot motion follows the instructor as they move closer or farther away from the camera. Users will be centrally framed no matter where they stand. Presenters can quickly switch between three tracking camera presets. An additional “rescan” button instantly activates IR lanyard reacquisition. Paired with Vaddio’s HD-20 HD PTZ camera option, the AutoTrak 2.0 system provides true native HD in a single chip and 20x optical zoom. Automatic and manual white balance modes were also added to increase control over lighting conditions within the presentation area.